The Red Dead Redemption 2 PS4 Pro bundle isn't anything fancy, just exactly what you need for high-def, HDR cattle rustling at a discount. Cowpokes who pony up for the bundle get a physical copy of Red Dead Redemption 2 (yes, it comes on a Blu-ray disc, this isn't one of those download code bundles), a 1TB PS4 Pro in jet black, and a matching PS4 controller, all for the standard price of a PS4 Pro by itself. And you can pre-order it starting right now via Amazon. 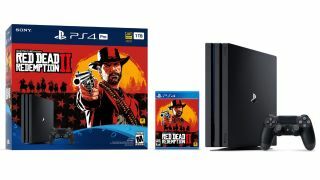 Red Dead Redemption 2 PS4 Pro 1TB Bundle for $399.99 on Amazon: This is everything you need to play Red Dead Redemption 2 complete with enhanced graphics and performance: the game on Blu-ray, a PS4 Pro console, and a DualShock 4 controller. Better get your pre-order in soon, it's bound to be big with holiday shoppers as well. We played on a PS4 Pro during our extensive Red Dead Redemption 2 hands-on session and were amazed by its "devastatingly beautiful sun-bleached scenery." It would also look great on a standard PS4 to be sure, and Sony confirms it will have HDR support for vibrant colors in either case. But if you're going to upgrade to a Pro for any game, it looks like Red Dead Redemption 2 will be a very solid choice. That deal is for customers in the US. If you're on the other side of the Atlantic, you actually have another option as well: a standard 500GB PS4 bundle with Red Dead Redemption 2 included - handy if you're on a budget or don't have a 4K TV and aren't all that excited about the visual benefits of supersampling. Amazon.co.uk hasn't updated its listings with those bundles yet but I'll update this article with links when it does.